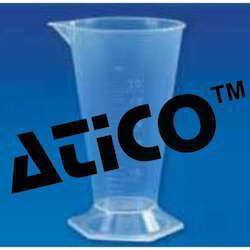 These conical measures are very good for measuring small quantities of reagents. Molded in polypropylene, these autoclavable measures have a hexagonal base which provides it excellent stability. The measures are clear, have good chemical resistance and have raised graduations for easy. These Conical Measures are very good for measuring small quantities reagents. Moulded in Polypropylene, these autoclavable Measures have a hexagonal base which provides it excellent stability. The Measures are dea, have good chemical resistance and have raised graduations for easy reading. 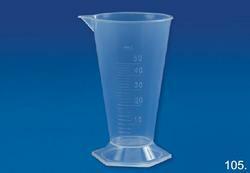 These Conical Measures are very good for measuring small quantities of reagents. Moulded in polypropylene, these autoclavable measures have a hexagonal base which provides it excellent stability. The measures are clear, have good chemical resistance and have raised graduations for easy. Backed by a diligent team of professionals, we have been able to manufacture and supply Conical Measure. Offered conical measure is made by our workforce utilizing the best grade raw material and leading techniques. we are dealing in Conical Measure. We are actively engaged in offering a qualitative range of Conical Measure for catering the diversified requirements of our clients.